But there are other reasons I love it too! If you’ve read any other posts in my blog, you probably know how important the concept of kindness is to me. And Valentine’s Day is just another great opportunity to spread a little extra love and kindness throughout our communities. It is also important to me that the kids learn about compassion, empathy, and kindness. So of course I wanted to get them involved! I thought their Valentine exchange would be a great way to reinforce these concepts while also spreading the message to their classmates. Disclosure: For your convenience, this post contains affiliate links. That led me to creating these cute Bucket Filler Valentine’s Day cards. 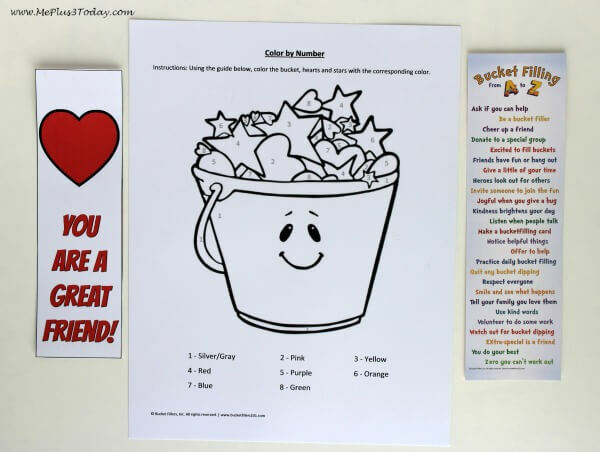 If you read my post about books that teach kids kindness, then you know we are big fans of the book, “Have You Filled a Bucket Today?” It is such a simple concept for preschoolers to understand, making it perfect to use for our Valentines. I just started putting them together again for this year’s Valentine exchange, so I wanted to make sure to share it with all of my readers. You can print off your own set for free using the links near the end of this post. But for now, let me show you what these Bucket Filler Valentine’s Day cards are all about and how to make your own! The Bucket Filler Valentine’s Day cards are actually 2 pieces because I liked the idea of literally filling a bucket. 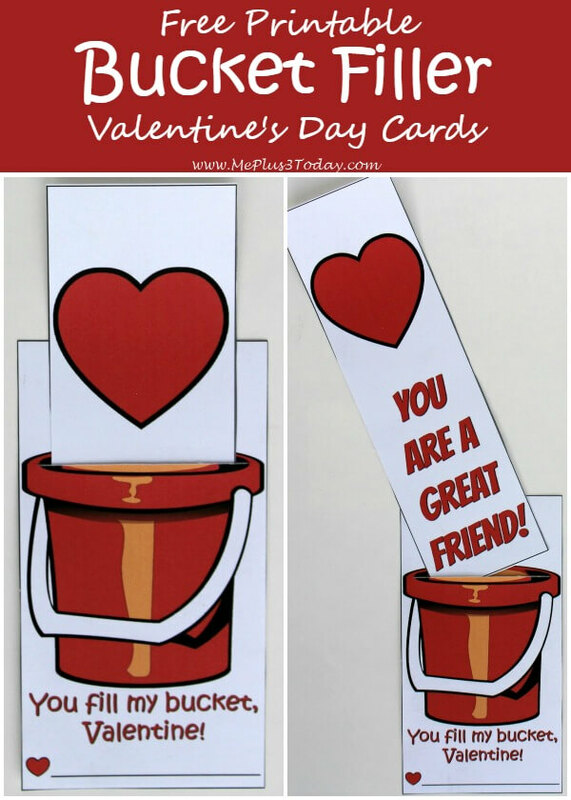 The base of the card has a simple red bucket and the saying, “You fill my bucket, Valentine!” It also has a line for your child to write their name. When cut out, this card measures about 3 inches wide by 5.6 inches tall. The second piece is then inserted into the bucket. In order to do this, I scored a line over the bucket opening of the picture with the sharp point of my scissors. Make sure you have a piece of cardboard or something below it so you don’t ruin any table or counter surfaces. I had to pass the point of my scissors twice over the card while applying pressure and it cut right through the paper. You can see the cut line on the end cards in the picture above. 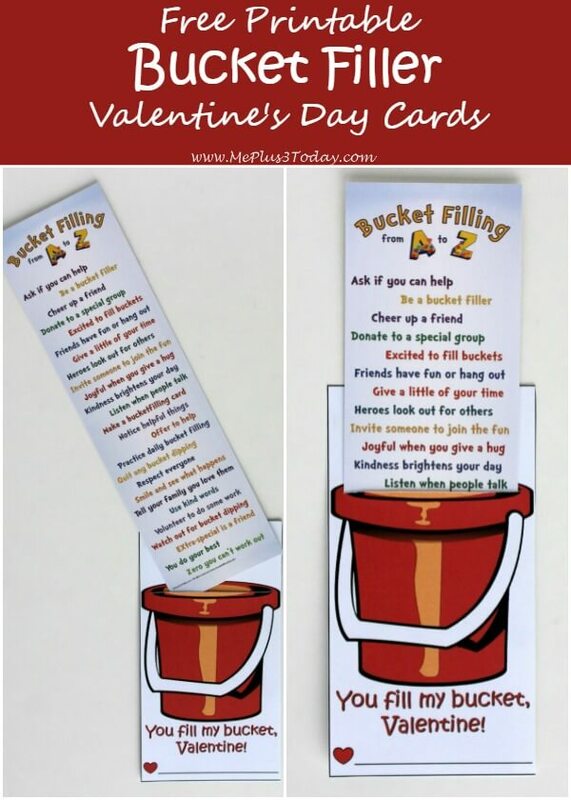 For our Bucket Filler Valentines, I purchased the “Bucket Filling from A to Z” bookmarks from the official Bucket Fillers website as an insert. The bookmark measures 2.5 inches wide by 8.5 inches tall. 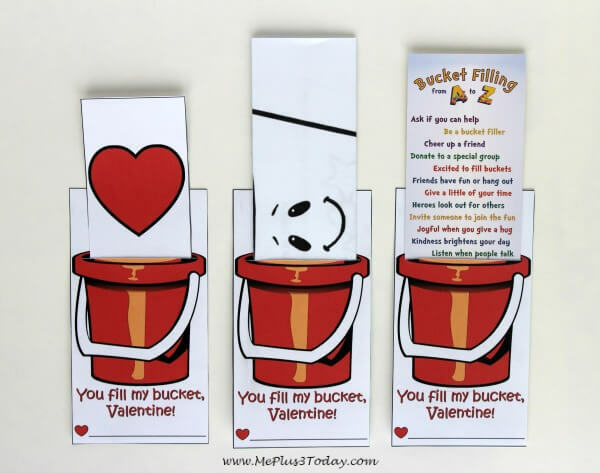 If purchasing the Bucket Filling from A to Z bookmark isn’t in your budget, I also have a couple options for FREE items to put inside your printable Valentine’s Day cards, as you can see in the picture below. I created a free printable bookmark with a red heart and the saying “You are a great friend!” as a FREE insert option. 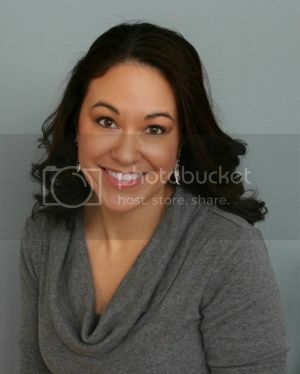 As you can see in the picture, it turns out super cute with the heart sticking out of the bucket. I’ve also made this printable available near the end of this post. When cut out, this free printable bookmark measures 2.2 inches wide by 7.5 inches tall. If you wanted to go above and beyond, you could punch a hole at the top of the bookmark and tie a red ribbon through it. I didn’t have time to do that, but I think that would add some flair to it. The other option for an insert is available on the official Bucket Fillers website. If you go to their Free Resources page, under the “Activities” section, they have a “Bucket Color By Number” coloring page that you can print off. I folded this up into 5 sections and inserted it into the bucket so that the smiley face was showing. After folding, the page measured about 2.2 inches wide by 8.5 inches tall. Overall, I think each insert option looks really cute! My kids are super excited to hand these out in a few weeks! If you enjoyed this idea, I would LOVE it if you could share it! Find it on Facebook, Pinterest, or Twitter! 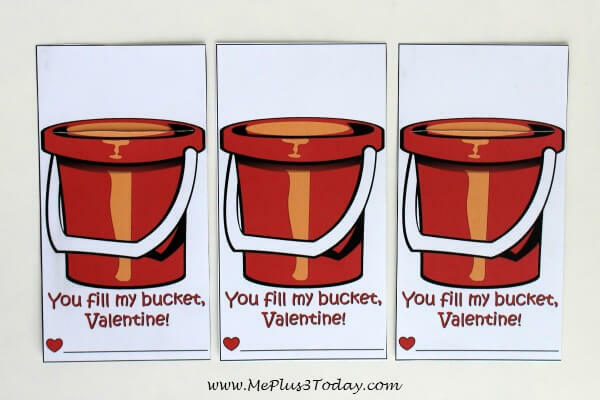 Click here to print “You fill my bucket, Valentine!” card. Click here to print “You are a great friend!” bookmark insert. Tagged Holidays, Preschoolers, Printables, Valentine's Day. Bookmark the permalink.